Heading south from Charlotte, I made it to the Atlanta city limits just in time for lunch and it seemed as good a time as any to finally give Lee’s Bakery a try. One of the multitude of pho restaurants on Buford Highway, I really first noticed Lee’s Bakery when I was trekking to El Senor Taco, but it was a passing mention in a New York Times article that cemented it in my radar. Walking into Lee's, you're quickly reminded that this is a bakery first and restaurant second. After eying the various baked goods, I had a seat and took a look at the menu. While full of the usual suspects, it was the daily special of soup and sandwich that caught my eye. $6.5 for a half banh mi and small soup? It certainly blows the pedestrian grilled cheese and tomato soup out of the water. 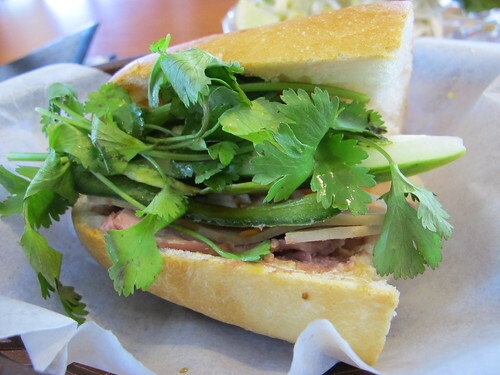 First to the table was my half dac biet banh mi. 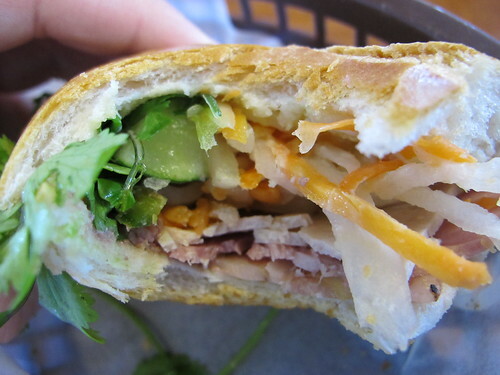 Stuffed into a housemade loaf, this banh mi was overflowing with greenery. Each bite carried the hearty crunch of French bread and the spice of pickled jalapenos, but I was surprised at just how much the flavor of the pickled carrots, onions, and peppers, dominated the sandwich. While there was a small, but noticeable amount of oddly sweet ham and pate, they played a definite second fiddle to the vegetables. 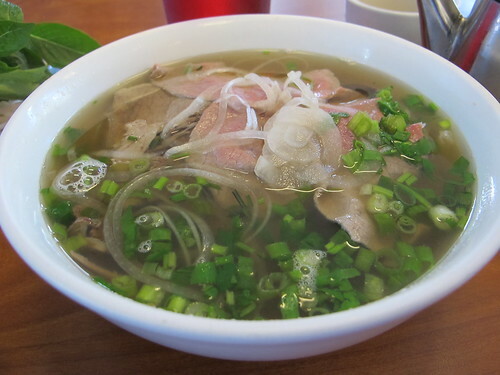 Although it wasn’t called pho dac biet, the pho with rare steak, well-done flank, brisket, tendon, and tripe certainly fit the profile of a pho dac biet. Despite an overload of sliced onion and green onion on top, it was the extra chewiness of the beef that really stood out. Aside from the beef, the broth was hard to describe. There wasn’t a particular flavor of anise, onion, or even beef, it was just a solid broth. 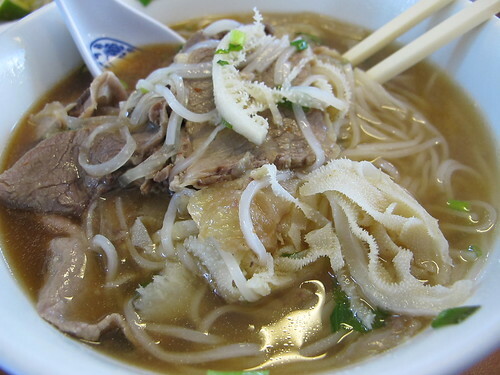 Enhancing the chewy texture of the pho, the tripe was served in big, poorly cut slices. Instead of blending in and providing a touch of texture to each spoonful, this tripe was front and center. 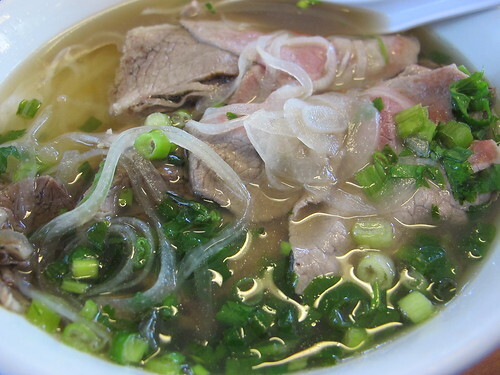 Even with the textural issues of the tripe, Lee’s Bakery offered up another solidly average contribution to the pho landscape of Buford Highway. On the other hand, the banh mis were less than impressive and certainly paled in comparison to my experiences at Quoc Huong. 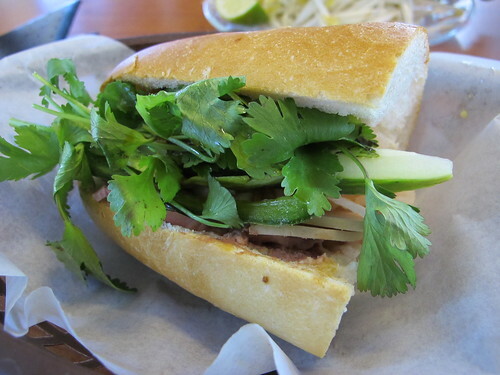 That being said, it’s hard to beat the pho and banh mi combo. With that as a daily special, I could learn to love Lee Bakery’s banh mis and pho.